So I went ahead with seperations, Here is the final outcome along with the seperations.I used the same 4 colors as previous post. I did lose some off colors from the previous post from bad file management but overall I am happy with it. I stuck with these colors, I think its as far as I can take it without any help. It still needs to be halftoned, cleaned up, and seperated. So I am trying to clean up my file and get a better understanding for colors. I thought I should share this because it helped me understand the spectrum of colors I can get from 1-Color Paper, and 4-Color Inks. So in reality its 5 colors. I approached it like mixing paint swatches... I created a swatch, did a simple black to white gradient seperately. I bitmapped and halftoned the gradient, pasted in as a channel. Made the selection, filled with swatch color and overlapped them. Heres the result of colors, remember I am not commited to these but an expirement. Keep in mind this totally changes when overlapped color and transparent inks comes into play. Some progress untill later in the weekend, trying to figure out this texture thing. Heres where I am going with my typography. The poster color and textures are unresolved but I wanted to move on with my type. The name and date are from a custom type and the address is from a font since it was so much info. Any thoughts on the font or placement? Thanks! Still experimenting with the moon, floating blocks. and havent explored textures yet. I re-drafted to a larger scale and added some more details.It still needs some tweeking and shifting but I feel its getting close. From here I will use my lightbox to transfer and ink. Until then I will need to decide my value patterns, textures, colors, and type. Reference images: Kilian Eng uses light line, dark fills and saturated color. Kevin Tong uses gradient to emphasize shape silhouette and then details and mixes layers of color to get many values from just a few overlapped screenprinted colors. After some sketching I realized what direction this project was going. I have combined the venue location, culture, and DJ Shadows futuristic style to guide me through this process. Like everyone else I had a million ideas. It wasnt until I put that pencil on that paper I was able to understand my limitations as an artist. I tried to create solutions to the visual and aesthetic problems my ideas had. Professor Michelon once told me you should always go with the most clear image you can picture in your head, meaning to not try to get too complex and create an image you struggle to visualize. Cheers! 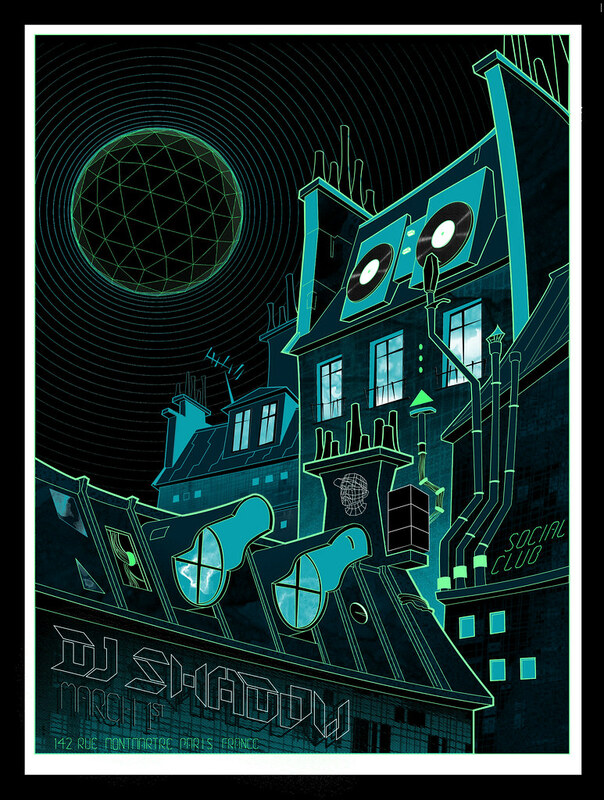 Reference images: DJ Shadows newest album cover, French comic book futuristic city, Parisian rooftops. Not shown is the Orb DJ Shadow performs in. -Detail of futuristic Parisian rooftops with strong angles, Eiffel tower in BG, type below. -Shadows orb on ground level with a tricky play on perspective that levels out int BG, type in orb shadow. -Overview of Paris and type on buildings. Reference images: Type with line gradients to look like vinyl record, Dead Hisrtoy font. Type Sketches: Playing around with angles and added elements, used Dead history as the base structure and mixed in some angles inspired by Matrix font by Emigre. Still an afterthought until my illustration is further developed. Thanks for the comments, criticism, Likes?, and fresh outside perpective on my work. Im thinking maybe some custom avante garde type with some illustration of fragmented futuristic cityscape and france cityscapes. 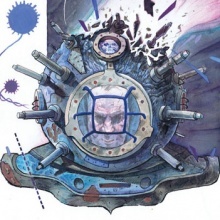 Maybe something like Brazil/5th element/metropolis, Still a distant thought.